Well! It took much longer than I planned (which is typically the case with our DIY projects), but now it is done and I am excited to proclaim, "We built a cabinet!" A little over a year ago we tackled our storage room and I organized all of my painting supplies on some open wooden shelves. I loved the outcome, but ultimately decided that certain stains, cleaners and spray paints would be better off stored in a location further away from the furnace and water heater. And if I were going to move some, I thought, better to keep everything together and just move it all. Since taking everything out of the storage room, my paint supplies have been hanging out in limbo. Stacks of cans and jars have been living in our laundry room until we could find the time and the right solution for getting things organized... again. I had been keeping my eyes out for some sort of cabinet, but nothing that was the right size, color, shape or style was hitting my budget. Therefore, things have just sat on hold for the last year. Until now! We decided to finally get something built to tackle the problem once and for all. Some of my paint supplies are pretty (jars of colorful paint), while others are less sightly (cans of stain). So, a combination of open and concealed storage would have to do the trick. And of course we didn't need anything too fancy, considering the ultimate function was just to store paint. Thinking it would be nice to have everything behind doors, I decided on glass upper cabinets and standard lowers. Although glass faced cabinets are probably totally DIY-able, I opted to seek some out to use and then build the cabinet around them instead. 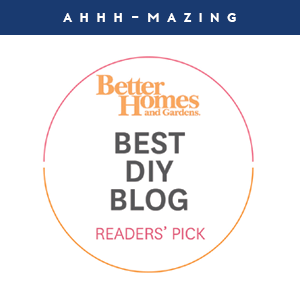 We checked out some home improvement stores, our local Habitat Re-Store and IKEA. 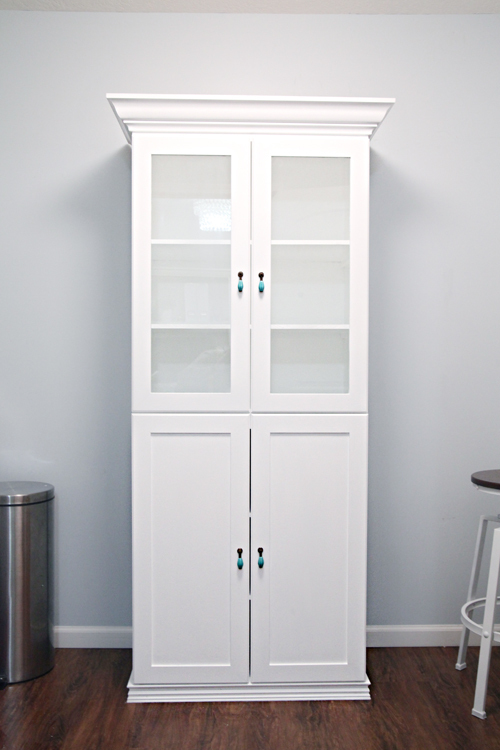 The most cost effective solution we came across were the BORGSJÖ white doors from IKEA, which was exactly what I was looking for paired with soft closing hinges and a fair price of $55 for all four doors. 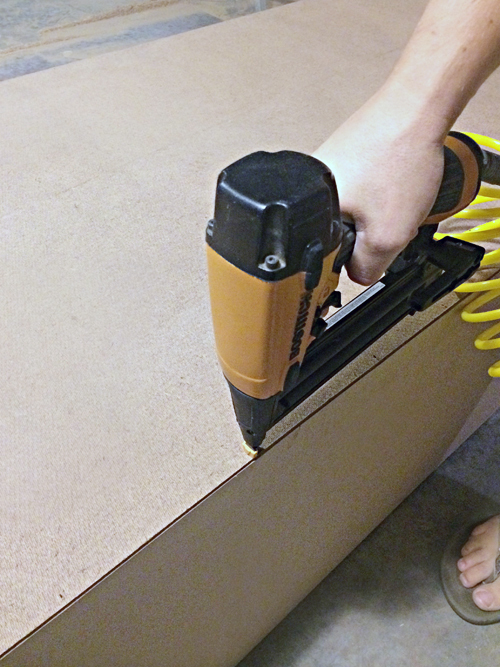 For this build, we purchased two 1/2" inch 4'x8' MDF boards from Home Depot for about $45. We also purchased 4" crown molding, decorative floor molding and a piece of 4'x8' MDF paneling. The entire piece was built out of the two MDF boards. Bryan started by laying out the doors and cutting pieces to size accordingly. Our IKEA did not have the white doors in stock for the bottom, but since I was planning on painting them, I purchased them anyway. 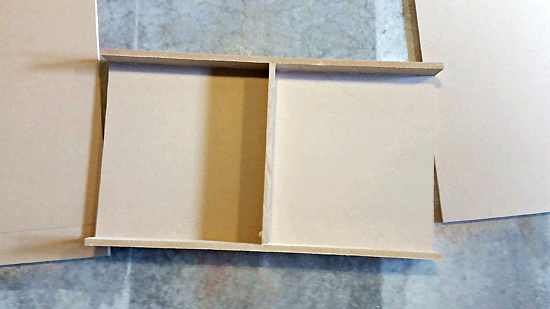 The final dimensions of the cabinet ended up at 75" tall x 29 1/4" wide x 16" deep. 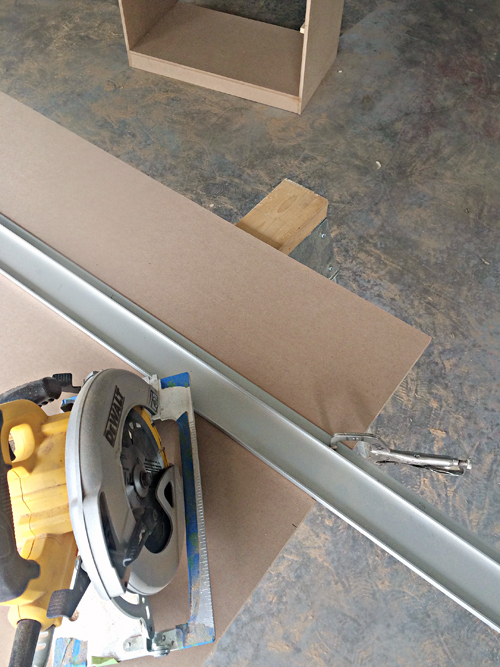 Using strips of the MDF, we began by making a sturdy base for the cabinet to sit on. This would also give us some height for the floor molding. Everything was affixed with a combination of wood glue and the brad nailer. All of the wood pieces were cut to size with our circular saw paired with the saw guide. 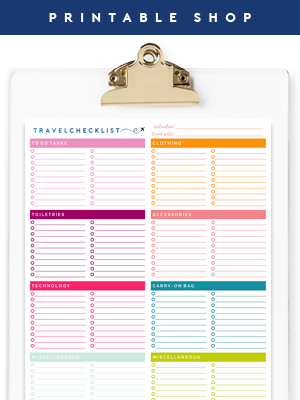 I think that guide is one of my hubby's most favorite tools, ever. 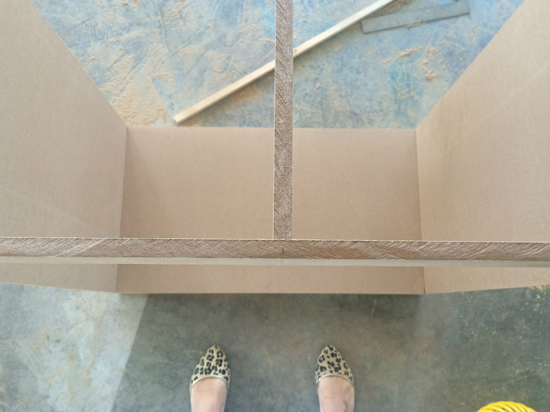 To ensure the cabinet was reinforced throughout, we built a second cross support at the center of the frame. Bonus points for woodworking in leopard flats. I got to play with the brad nailer for this project and now that I have learned how to use it, it just be my favorite tool! Because the shelves would be holding a bit of weight, we added extra strips of scrap MDF along the edges as added support (also glued and nailed in place). 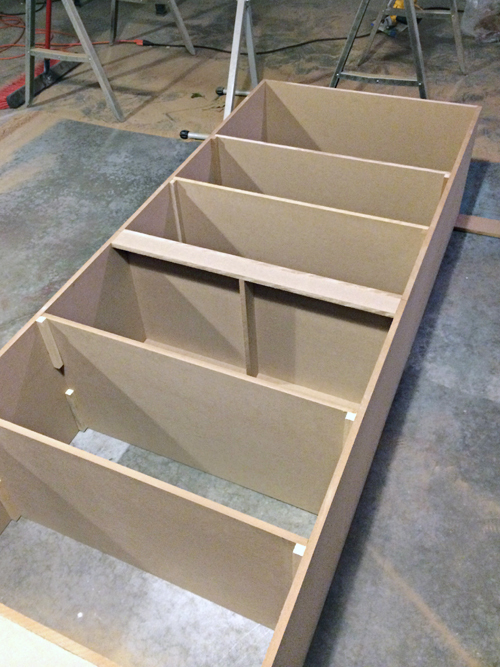 Here is a view of the frame with all of the shelves assembled, as well as the bottom side of the middle shelf. We ended up adding one more strip of support across the top of the cabinet as well, where the crown molding would ultimately be attached. The final building step was to add the MDF panel to the back, and caulk everything in with white painter's caulk. 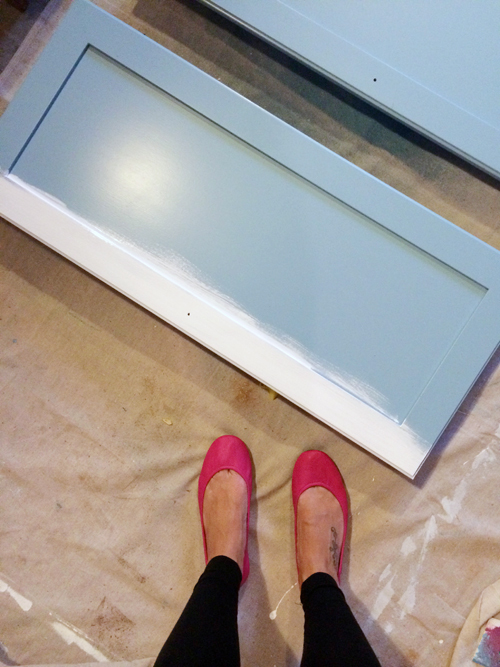 As I mentioned, I planned on painting the entire cabinet as well as the IKEA doors we purchased. So I started with a coat of primer on everything. Then, I had to decide on a color. I went through my paint stash and no surprise, had about 15 different tealy blues to select from. I even popped a coat of one onto the doors and placed them into the laundry room to test things out (FYI - these painting pyramids will be your best friend when painting cabinet doors). But considering our laundry room already has a lot of pattern and color happening, and that there would be clear display in the top of the cabinet adding to it, I decided that maybe I should just stick with boring ol' white. Totally not my style, but sometimes I surprise myself. So back to the painting board I went, and FOUR coats of Behr Ultra Pure White paint later, we were able to move her inside to her new home. The IKEA doors came with nice hinges, so it was just a matter of pre-drilling some holes into the inside of the cabinet and attaching the doors as the final celebratory step! I already use the Anthropologie melon pulls around my home (our nightstands and painted dining room hutch) and we really love them, so it was my natural default to add a little color and class to this new cabinet as well. I just keep looking at the cabinet and high fiving my Mr. shouting, "We made that!". True story friends! 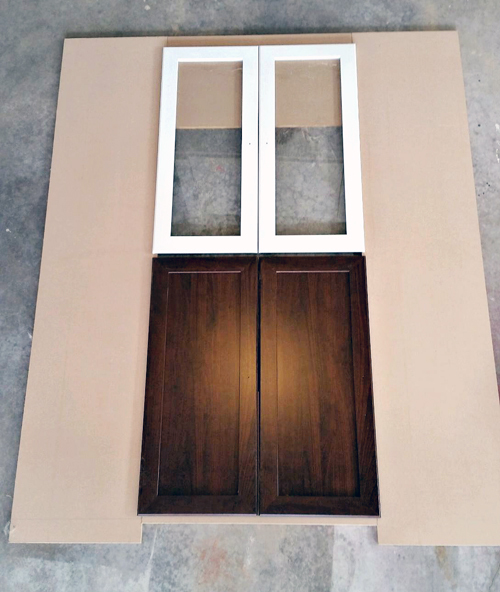 Essentially, it is just a giant MDF cabinet, showing the power of paint and decorative accents like molding, hardware and even pretty glass doors. 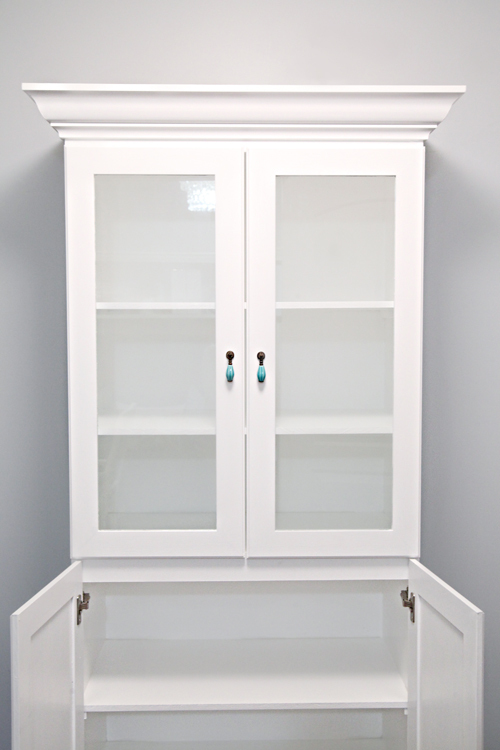 I really love that we were able to customize something to fit our space and our needs and create a unique piece that will rock as laundry room paint storage. I am guessing you know where I will be after the boys head to bed this evening... loading this baby up of course! I was also able to reuse some of that bird paper to cover a few boxes this weekend, and I can wait to pop those beauties behind the glass doors! I have piles of laundry, paint and supplies on the floors at the moment, so for now, I will leave you with the beautiful shot of our week long project and give you a bigger room shot once I clean things up a bit. Until then, I am off to continue my celebrating of a pretty DIY cabinet that will be a versatile storage piece for us to use for many years to come! What a great idea to use partial 'ingredients' with handmade design! I was wondering about the MDF board- do you know how it will hold up with the weight of the jars over time? Like will it bow in the center like regular wood would? I couldn't tell if you had added supporting braces along the back as well as the ends of each shelf? I can't wait to see it all filled up! 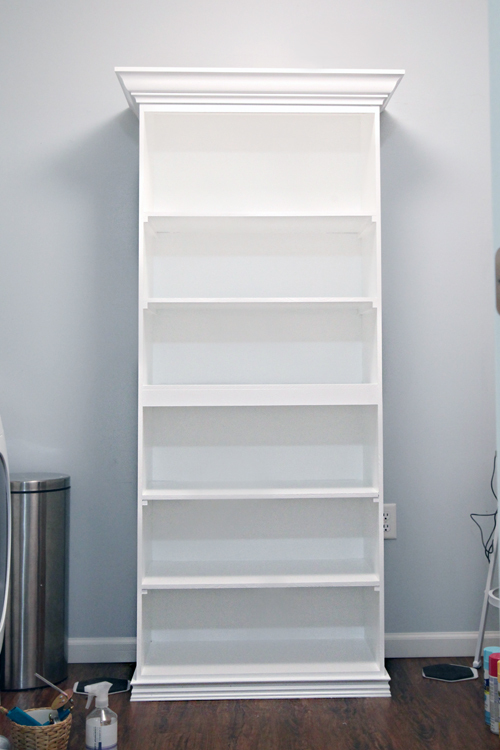 We previously built a similar style wall unit out of the same MDF, which also included shelving, and so far, so good! No bowing or sagging, so I am crossing my fingers with all of the added reinforcement, we will be OK. If the cabinet were any wider, we may have added even more in the far back, and still could down the line should we need to. xoxo! Jen, everything you and Hubby do is awesome and this piece is no exception. When you labeled and systemized your paint cans I showed my hubby the results as he was thinking of doing some paint can organizing too. He said "This woman even makes paint cans look good!" And so you do! Hope you show us this piece when it's loaded up. I love it! This turned out awesome!!! Love it!! I love the brad nailer too. Greg has one. I am allowed to use that. I just can't use any saws. LOL I almost cut two fingers off with the hedge trimmer one time, trying to separate the bushes to trim them down. I was holding it in my left hand, and I am predominantly right handed.. not very ambidextrous. Thus the reason everything is VERY SLOW going at our house with a hubby who works 65 hrs a week, including weekends. I have hardwood floor taunting me in our front room, waiting to be installed... if only I wasn't so accident-prone. Please post a photo loaded up and wall papered!! Can't wait to see it in the space! This is amazing! You and your husband are so talented! 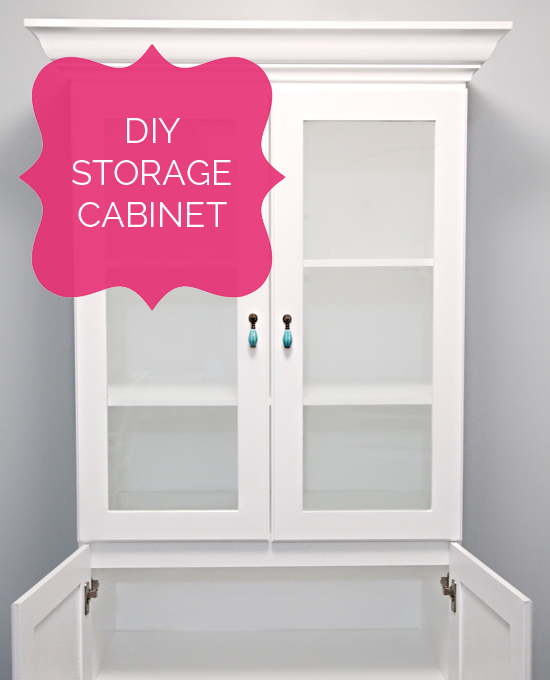 I am so inspired and love this beautiful storage cabinet! Looks great! Did you paint the glass Ikea doors, too? We like ikea cabinets but not the available colors. Would look great in any room - very nice work. Wow. You two are amazing! Thats look so amazing. You are so talented. 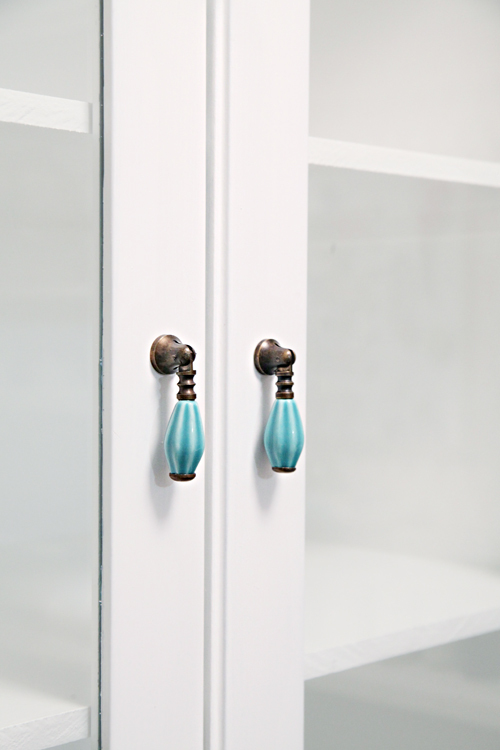 I love the knobs you put on the doors, so pretty. 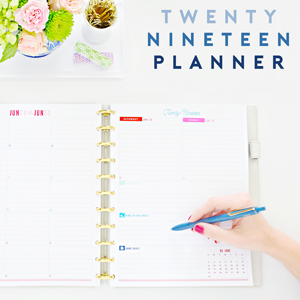 A fun and practical project, which is always the best kind. 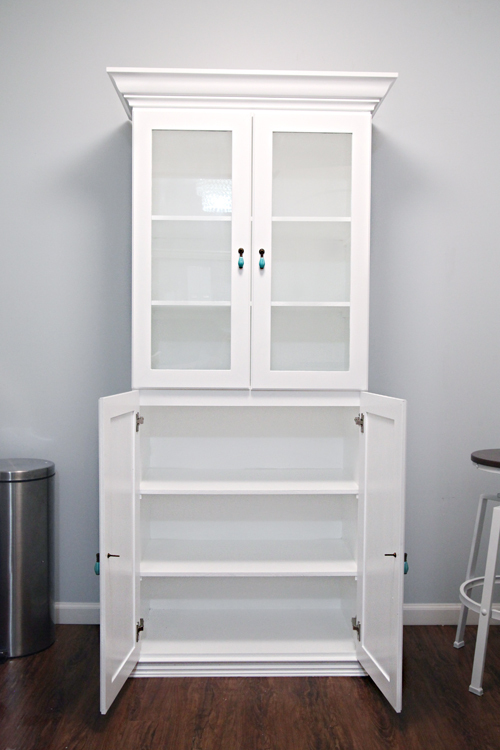 Reworking IKEA products can be such a cost effective solution to so many storage projects. Are those hot pink tieks? Be still my heart. So great! You are so talented and hard working! 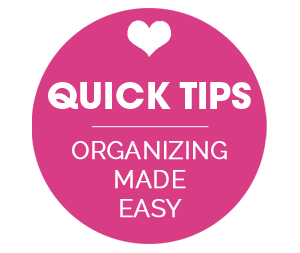 An itty bitty question: Did you consider chunkier moulding at the base? I think this tall guy can get away With that. Or what do you think? I not only love your decorating tastes, but those shoes- very cute! Way to stay girly during building and constructing things :) Where do you shop for shoes? 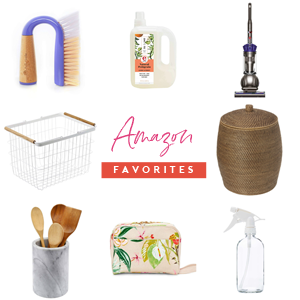 Mostly Amazon, Nordstrom and DSW. :) Once I find a pair I love, I google around for the lowest price. xoxo! WOW! 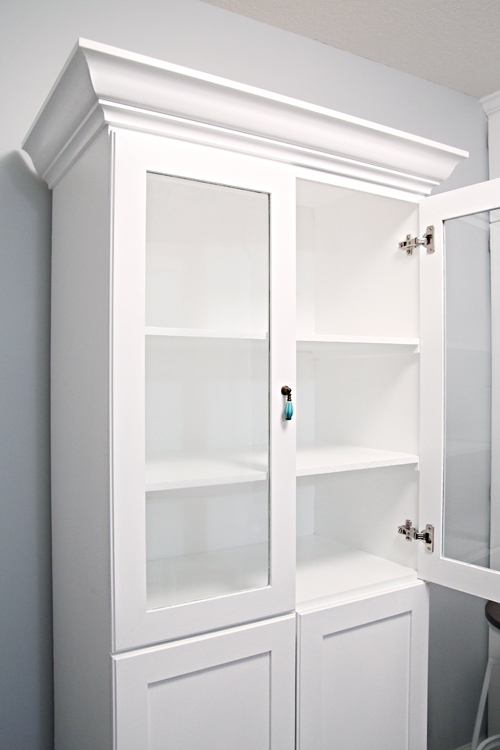 What a great idea to buy doors and build a cabinet around them. Will you please share the brand name on that circular saw guide? I didn't know such a thing existed and I definitely need one. Great job on everything. I love the blue touch on the handles -- such a cute idea! I'd love to know where you got your leopard flats and the pink flats as well! So obsessed with both of them! Thanks Sandy! The leopard flats were purchased on Amazon: http://amzn.to/1zjX2dT and the pink flats are Tieks. :) xoxo! Wow, you are both so clever! Just wondering if it is much cheaper to DIY rather than buy a premade cupboard and adding or changing the doors and handles. IKEA may have had a cabinet that was similar in size and price, but I probably wouldn't trust the weight of the paint on IKEA shelves, and I know they didn't have anything with the depth I was after. This way, I have a unique, custom piece vs. something off the shelf. Total cost came in around $130.00 for materials plus another $24 for the hardware. FYI….I noticed that someone in the photos was in flip flops using a power tool?!?!? I hope you recommend necessary protective measures in your blog for any projects - closed toed shoes, protective goggles, masks when using oil based paints, etc. Safety should always come first no matter how great the idea…..
Agree, flip flops are not the most logical choice when woodworking. We definitely recommend everyone take proper safety measures. P.S. Any special tips on painting MDF? Did you use a specific primer? Jen this is absolutely beautiful ~ you did an amazing job! Hi Jen! As always, another beautiful and inspiring project! 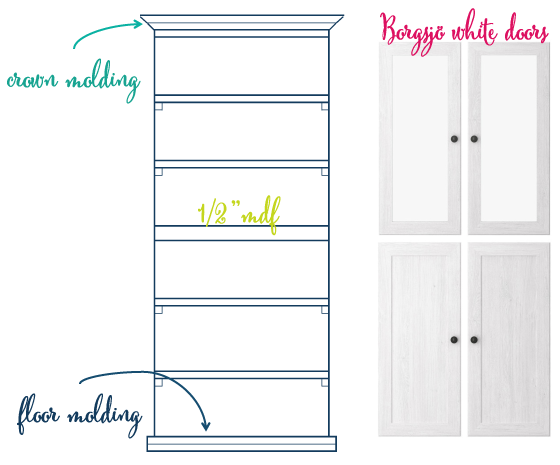 We have a white Borgsjo bookcase that we are planning to paint. What kind of primer did you use? Did you apply a top coat/clear coat at the end and, if so, what kind? Any other tips for me? Thank you!! I always recommend an oil based primer. I typically use Zinsser and have been really happy with it. If you have a good white latex paint, it should fully cure within 28 days with no top coat needed. However, for high traffic areas or to begin using sooner, a top coat is recommended, I love Minwax Water Based Clear Satin and recently also fell in love with Varathane's Triple Thick Poly (which only requires one coat and dries really fast). Happy painting! !